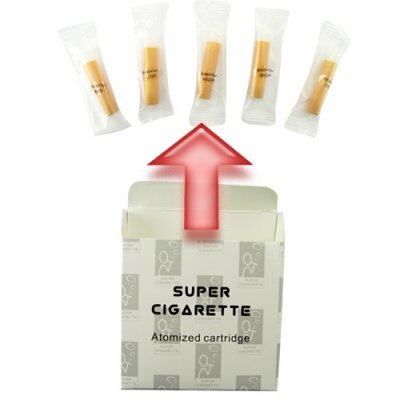 Successfully Added E-Cigarette Refill Pack w/5 Cartridges (for CVSBP-5800) to your Shopping Cart. E-Cigarette refill pack with 5 regular flavor refill cartridges for this popular anti-smoking nicotine replacement technology (refill cartridges for the CVSBP-5800 e-cigarette). If you are finding it difficult to kick the cigarette habit, then you can try the safe and easy to use E-Cigarette and these extra nicotine cartridges to give your body the slow adjustment it needs to successfully dump the habit for good. Each refill box contains 5 cartridges containing high to low nicotine doses with a realistic cigarette flavor. A perfect product for those are ready to a healthy high-tech smoking alternative, or anyone who needs to source additional cartridges for their existing E-Cigarette. We are offering these nicotine refills at a quantity of at least 5 packs in order to give you the absolute best advantage from our low price and even better shipping rates. With a required order of 5 refill packs the total number of refill cartridges would be 25 (5 cartridges x 5 packs = 25 cartridges total). E-Cigarette refill pack with 5 regular flavored cartridges for the CVSBP-5800. Can only say that they arrived quickly and they work really well. Can only say that they arrived quickly and they work really well. You can see some reviews on youtube. I would recommend them and Chinavision.